Greetings Vintage adept! Welcome to my Dark Ascension Vintage Set Review. This will be the most comprehensive review of Dark Ascension for Vintage play available anywhere. I will carefully analyze every card in Dark Ascension for potential Vintage format applications. I will bring to bear not only my expertise, but unmatched experience in evaluating new cards for Vintage play. Not only do I have a proven track record of accurately forecasting new cards for Vintage play, my careful and detailed analysis snares cards that other reviewers overlooked or dismiss. I hope you find this set review enlightening and practical as you decide which cards you will acquire from Dark Ascension, and how you might approach the set from a deck construction perspective. Dark Ascension is very much the heir to Innistrad, which set Vintage on the crash course it is currently veering uncontrollably along. In particular, Innistrad introduced three creatures that have contributed to a more creature-centric metagame. Beyond Innistrad, the rise of Landstill as a metagame predator and the strength of Mystic Remora are two additional factors that have pushed Vintage onto a creature trajectory. By the close of 2011, the critical question for the future of the format was whether Vintage would continue on the same course or whether creature-centric strategies would prove unsustainable, a flash in the pan footnote on the overreaction to Landstill and Mystic Remora. Powerful counter-measures like Oath of Druids seemed poised to return, and their resurgence could end the spell of Tarmogoyf & Company’s brief reign over the Vintage landscape. Cards like Time Vault seemed positioned to combat the creature infestation. Misdirection was moving in to punish overreliance on cards like Snapcaster Mage. A month ago I predicted for early 2012 that the salience of creatures as both strategic and tactical options would continue unabated, and offered many of the cards just described, and others, as innovative tactics and strategic solutions. Dark Ascension was the missing puzzle piece. Other than restrictions, there is no force more powerful than the introduction of new sets to disrupt the flow of metagame currents. New printings interface the entire evolving metagame system simultaneously, cajoling it into new directions and spinning out new evolutions. The overarching question for the format was whether the trend toward creatures would continue, abruptly end or taper out, and Dark Ascension would provide most important set of clues to answer that question. Would Dark Ascension promote a course correction? Would it provide tools to answer the variety of creature threats Innistrad introduced and the metagame advanced? Or would Dark Ascension be a mixture, providing answers and new threats, stirring the metagame pot into unpredictable directions? Would it be a steady influence, abstaining from the major questions of the moment, serving mostly as a flying buttress, allowing the metagame to evolve along a natural course? Or would it accelerate the trends set forward by Innistrad and the metagame factors already mentioned? All of these possibilities loomed, and now that Dark Ascension is before us, the answer is clear. Dark Ascension is the heir to Innistrad. Whereas Innistrad brought into Vintage a few key playables, it gently nudged the metagame system in the direction of creature-based strategies. Not only did Snapcaster Mage, Delver of Secrets, and Laboratory Maniac all see significant play, but Stony Silence provided another tool for Aggro-Control decks, and Witchbane Orb another Oath solution for Workshop Aggro decks. Innistrad was the rudder for the Titanic. Innistrad wasn’t an engine, powering the metagame forward, but it set the metagame on an ineluctable course. The speed and force of change would be decided by us. What distinguishes Dark Ascension from Innistrad is that this set puts the foot to the pedal. The answer as to what effect Dark Ascension might have on Vintage is abundantly clear. Dark Ascension firmly accentuates the trend towards creatures. The metagame system is now being clearly directed with flashing lights and neon signs into a path of inevitable and undeniable creature salience. Dark Ascension puts the foot to the pedal on the dominant trend in the Vintage format. Every viable Vintage playable from this set screams the same message: creatures are good; consider them. It is a message that is as alien and unaesthetic to the Vintage mind as the thought of Balance or Tolarian Academy is to the Standard player. The most powerful tactic that might abate the proliferation of creature-based strategies, Oath of Druids, has been castrated. Grafdigger’s Cage is without a doubt the most powerful simple solution to Oath of Druids ever printed, providing a one mana solution to every single Oath simultaneously. While it doesn’t destroy Oath as a strategy, it undoubtedly diminishes its effectiveness and strength. In addition, the most powerful anti-creature tactics – and in fact, the most powerful strategic finishers in the game – Tinker for Blightsteel Colossus and Yawgmoth’s Will, are simultaneously neutered by the same card. The consequence is to emphatically rebalance the scales of justice in Vintage. Grafdigger’s Cage is the new sheriff in town, and the degree of its presence in the metagame moving forward will dictate what is possible and what is not. But it is not simply the Cage that punishes the dominant anti-creature strategies of the format. There is a genuine arc towards beats and Fish type strategies in this set. 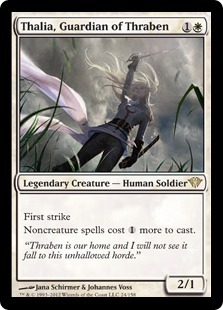 Thalia, Guardian of Thraben is one of the best White creatures ever printed. She is Thorn of Amethyst on legs, and heavily disrupts non-creature strategies, especially storm-based strategies, which are brutally punished by such effects. Torch Fiend and Thraben Heretic provide playable answers to common strategies, and significantly enhance the options that Beats decks have at their disposable for combating both Workshops and Dredge. 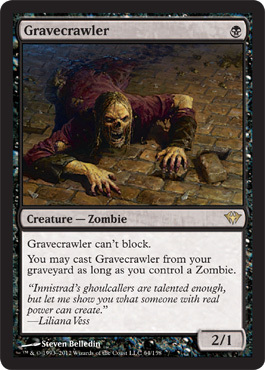 Similarly, both Gravecrawler and Ghoultree are two potent Dredge tactics that emphasize the important of on-board threats – beatdown and combat – that can be deployed either as a response to the Cage, or as a counter-strategy for addressing cards like Yixlid Jailer, Tormod’s Crypt, and even, in the case of the former, Leyline of the Void. Even the remotely playable spells indirectly incentivize the development of creature based strategies. Cards like Faithless Looting, if they are playable at all, must be playable in Madness-like decks. Similarly, Markov Blademaster provides a fast clock for heavy red beatdown decks. While Aggro-Control has long been a part of the Vintage landscape, genuine Beats decks – decks that generally do not rely on Blue or countermagic – have been absent or quiet for nearly a decade. Certainly, decks like the R/G Beats or W/G/x Beats decks I developed a few years ago have seen moments of viability, but nothing sustained. Nothing permanent. What Dark Ascension tantalizingly suggests is the possibility – if not the promise – that creature decks will have a firmer foundation in this format. That creature based strategies that are not Blue – strategies like mono White, mono Red, R/G, R/W, R/G/W, or W/G/B — have a real chance to compete. Cage and Thalia are the vanguard of this trend, but far from the only new printings to support it. And, for that reality, you have to go back to the very early years of the format to see anything resembling it. Dark Ascension is a misnomer. It portends a bright future for Magic’s oldest format. although they seem more remotely useable. Snapcaster Mage has appeared in 70 reported Vintage Top 8 decklists. Stony Silence has appeared in 7 Vintage Top 8 decklists. Witchbane Orb has appeared in 5 Vintage Top 8 decklists. Memory’s Journey has appeared in 3 Vintage Top 8 decklists. Laboratory Maniac has appeared in 9 Vintage Top 8 decklists. Past in Flames has appeared in no Vintage Top 8 decklists. Liliana of the Veil has appeared in 4 Vintage Top 8 decklists. Victim of Night has appeared in no Vintage Top 8 decklists. Delver of Secrets has appeared in 6 Vintage Top 8 decklists. Geistflame has appeared in no Vintage Top 8 decklists. Purify the Grave has appeared in 1 Vintage Top 8 decklist. Forbidden Alchemy has appeared in 1 Vintage Top 8 decklist. Despite Mark Hornung’s valiant effort to make Control Slaver viable with Forbidden Alchemy, I said “I would be surprised, but pleasantly so, should it appear in more than a few Vintage Top 8s.” Unfortunately, I’m not surprised. 2) It will be one of the best creatures in Vintage, and possibly the best Blue creature of all time. I’m not sure if it will be as broken as Dark Confidant has proven itself to be, but it has that potential. As a point of comparison, Dark Confidant has only appeared in 64 Top 8 decklists over the same time period that Snapcaster Mage appeared in 70. That puts Snapcaster Mage on pace to be the best Invitational creature, and arguably the best Vintage creature ever printed. The next most played card from Innistrad is another Blue creature: Laboratory Maniac, which I broke in Maniac-Doomsday, for which I wrote a primer and Top 8 tournament report here. Stony Silence put up probably slightly fewer Top 8 appearances that I would have expected, although with the rise of creature decks, we can expect those numbers to climb in coming months. Sensei’s Divining Top on turn one, you get a turn two 3/2 flyer. The library manipulation cost required to make this work is probably worthwhile, and not a terrible investment. This might even be better in Legacy. This even fills the one mana niche for creature spells. The trigger is also such that you don’t have to reveal the card unless you want to, so you don’t have to risk revealing critical information, and you can use that information to decide, for example, whether you want to cast Vampiric Tutor, break a fetchland, or otherwise manipulate your library. which it is better than Delver of Secrets, but Delver of Secrets is probably a better overall one-drop. This is good card in terms of the efficiency of power to mana cost. Its ability also provides relevant situational information. I just don’t know whether it will see play in Vintage because of the inherent lack of small creatures in the format. It turns out that Delver has now become the best 1cc Blue creature in the format. A big reason for the rise of Delver has been the emergence of decks like Landstill and Remora, and the resulting creature backlash. Witchbane Orb has made its modest showing, but I fear will quickly disappear with the upcoming printing of Grafdigger’s Cage, from Dark Ascension. Liliana and Memory’s Journey have likewise put up their expected trivial appearances. Those cards have all earned a spot in the Vintage checklist. The rest will have to prove themselves further. In most cases, cards that are obviously unplayable will receive little attention, and a succinct explanation for this designation will suffice, usually with a citation to a comparable effect on a superior card. However, in the case of novel effects or unique printings, a more detailed explanation will be provided. Cards that fall into the ‘Unlikely, but Remotely Playable’ category aren’t likely to see play in Vintage, either in the near term or the future. They may offer advantages that are only slightly or marginally better in corner cases to marginally playable Vintage cards. Some remotely playable cards offer abilities or present characteristics that are unique, novel, or without clear precedent in the card pool, and are not sufficiently powerful to conclude that they will see play. Alternatively, while the functions or effects offered by these cards may have precedent, they are presented in packages that are unique, and difficult to evaluate. Consequently, they cannot be written off as Vintage unplayable. None of these cards are likely to see play, but under the right circumstances and in the proper environment, they may find a home. Cards in this category are given more descriptive analysis than was offered for cards that were evaluated to be unplayable. Cards that I determine to be Vintage playable may fall into one of several categories. The card in question may be superior or comparable to an existing Vintage playable (e.g. Lodestone Golem or Stony Silence). The card may generate a unique or novel effect that may used to combat or improve established strategies (e.g. Grafdigger’s Cage or Laboratory Maniac). Playable cards might also create new tactical or strategic possibilities that seem interface synergistically with the metagame or card pool (e.g. Ad Nauseam or Tezzeret the Seeker). Alpha Brawl – An Arena/Contested Cliffs/Triangle of War for all of your opponent’s creatures for the cost of an Obliterate. Altar of the Lost – There are many three casting cost artifacts that generate mana: Basalt Monolith is the original, but more recent iterations include Coalition Relic and Darksteel Ingot. Each obviously offers some modest advantages over the other. Palladium Myr is a card I flagged for potential playability since it’s largely an upgrade from Sisay’s Ring/Ur-Golem’s Eye. But it’s not better than Metalworker, which is really the gold standard for non-Alpha artifact acceleration in Vintage. Hell, Grim Monolith is also unrestricted and sees almost no play. Like Metalworker, this card offers recursive value, but has a very, very narrow scope of cards it can be used to play. In fact, there are less than 100 cards in Magic with Flashback. Dark Ascension may push that number over 100, but that’s still a tiny, tiny fraction of the overall card pool. I really like that they made this card versatile enough in other respects to play any Flashback spell, but they limited it in other ways, such as by preventing you from casting the Flashback spell with Altar in the first instance. Even if this card cost 1 mana and tapped for 3 mana of any combination of colors, I’d have a hard time seeing it used. It would have to be able to cast flashback spells in the first instance as well. This card is not Vintage playable. I’d rather play Coalition Relic in almost anything. Archangel’s Light – Comparable to Ancestral Tribute. Artful Dodge – Comparable to Infiltrate and Distortion Strike. Neither of those cards has ever seen Vintage play. Avacyn’s Collar – Comparable to a host of similar Equipment (e.g. Silver-Inlaid Dagger, Viridian Claw, Specter’s Shroud, etc.). Bar the Door – Comparable to Aven Warcraft and Fortify, and worse than Steadfastness. Black Cat – A bit worse than Ravenous Rats. I’d rather have the discard trigger when the creature comes into play, but this is almost counterbalanced by the random element in the discard. Better have Cabal Therapy ready when this creature is cast. Bone to Ash – Strictly inferior to Exclude. Is Exclude really too good? Blood Feud – Destroys two creatures the opponent controls for six mana. Fire/Ice can do the same for 2. Break of Day – Strictly superior to Glorious Charge. Briarpack Alpha – Strictly inferior reprint of Briarhorn. Burden of Guilt – I’d rather have a Whipcorder or Stormscape Apprentice type creature, but this card is comparable to Shackles. Burning Oil – Worse than Firebolt. Chalice of Life/Chalice of Death – Artifacts that gain life or deal damage have been present since Alpha. This card does both, and in a clever way using the transform mechanic. This card begins as a Braidwood Cup, and then transforms into Aladdin’s Ring aka “Shotgun” without the activation cost. Except for the fact that the transform is mandatory, this card is almost strictly superior to Braidwood Cup. Unfortunately, this confirms is unplayability. Not only is lifegain among the worst possible forms of Vintage Magic (unless used for some sick combo), the idea that you would use this card to gain 10 life in order to flip it is laughable. This card will never, ever transform in Vintage on its own accord. Outside assistance would be required. And, expending the effort to gain 10 life to begin dealing 5 damage a turn is terrible. Why not just play Lodestone Golem or Juggernaut instead? This card has no place in Vintage. Chant of Skifsang – More efficient than Torpor Dust and Sensory Deprivation, but less castable than the either. Unplayable in Vintage. If you are trying to stop Blightsteel Colossus, just cast Chain of Vapor instead. If you are trying to stop Tarmogoyf, just steal it with Mind Harness or Sower of Temptation. Chill of Foreboding – A larger Whetstone (because symmetrical) effect as a Sorcery. Inferior to Glimpse the Unthinkable. Chosen of Markov // Markov’s Servant – Three mana 4/4s without disruption or card advantage are not playable in Vintage, especially those without evasion. This is worse than Phyrexian Negator, which hasn’t seen significant play for quite a while. Clinging Mists – Fog/Holy Day is better than vast majority of the time. Counterlash – Mana Drain allows you to do this for two mana. Seriously though, the problem with this card is that it’s simply too expensive. There is almost nothing you would normally have in hand in Vintage that you would ‘cheat’ into play with this. Suppose, for example, you countered a Jace, the Mind Sculptor. You would then play your own. Vintage Control decks usually do not have 6 mana untapped and available until they have nearly won the game or the game has entered the final stages. As a card used in a deck designed to cheat large monsters into play, it may have marginally greater utility, but it is still expensive and unreliable. This is, nonetheless, a card to keep in mind should they ever print a really expensive game winning bomb. However, to utilize it, you’d have to fill your deck with garbage. Crushing Vines – A modal Plummet/Oxidize for the combined mana cost of both. It’s too bad this card doesn’t do both. It might have seen Vintage play. Curse of Bloodletting – Worse than Furnace of Rath. Curse of Misfortunes – As a recurring effect generating card advantage, this is a potentially quite useful. There are three reasons why this card won’t see play. First, it costs 5 mana. The effect won’t begin until the turn after you’ve resolved this pricy enchantment. If this cost 2 mana, it could be Vintage playable. Second, with Dark Ascension, there are only eleven curses in the Vintage card pool, and they are all anemic. The effects they generate are timid and predominantly pertain to combat. The Blue and White curses are more Vintage relevant. If you are going to build a curse deck, you need a wider range of possibilities. Finally, this card limits duplication, so you can’t double up on the most powerful effects. This card won’t see play, at least not until they print more powerful (and cost effective) curses. Curse of Thirst – A win condition in a Curse of Misfortunes deck. Not playable until Curse of Misfortunes is playable. Dawntreader Elk – Marginally better than Viridian Emissary. Death’s Caress – Comparable to Sever Soul, and just worse than Doom Blade. Deranged Outcast – Reminiscent of Spike Feeder. Simultaneously more and less versatile, and more efficient. Diregraf Captain – Marginally better than Cemetary Reaper. Drogskol Reaver – Creatures that cost 7 mana are not cast, but cheated into play in Vintage. This isn’t an artifact, so that rules out Tinker or Metalworker. That leaves predominantly Oath of Druids or Dread Return. This lacks enough of a disruptive effect immediately for Dredge, but it is a remote consideration for Oath. Although the wide range of superior Oath targets (e.g. Jin-Gitaxias) pretty much rules this out as ever seeing Vintage play. The only way this might see Vintage play some day is if lifegain becomes a prominent part of the metagame. Dungeon Geists – Kor Hookmaster in Blue, with flying, and one more mana. Kor Hookmaster has never been playable in Vintage. Elguad Inquisitor – Mausoleum Guard with lifelink. Erdwal Ripper – Worse than Slith Firewalker. Executioner’s Hood – Comparable to Nim Deathmantle: sometimes worse, sometimes better; neither Vintage playable. Faith’s Shield – Comparable to Razor Barrier. Falkenrath Aristocrat – There can be no denying the efficiency of this threat. For a 4/1 flying haste creature, 4 mana is about the best deal you can get (compare to Volcanic Dragon). However, there are very few 4cc non-artifact creatures that ever see play in Vintage (Sower of Temptation, Auriok Salvagers, etc.). Each of those has a utility function. This won’t be the first. Falkenrath Torturer – It would take three creature sacrifices into this card to make it as large as a Phyrexian Negator, which no longer sees play in Vintage. Farbog Boneflinger – Strictly inferior to Keening Banshee, which is inferior to Nekrataal. Favor of the Woods – Comparable to Luminous Wake, although the difference is more subtle than may first appear. Feed the Pack – This variant on Doubling Season/Wild Pair generates creatures by sacrificing other creatures. And it costs 6 mana. Fiend of Shadows – The ability to play cards from the opponent’s hand is potentially quite powerful. This can be a source of not simply disruption, but card advantage. Unfortunately, there are a few limitations that convince me this card won’t see any Vintage play. Most obviously is the egregious casting cost. If you could Ritual this creature out, then there might be a case. But the real problem is that the exiling is not random. Since the opponent can select which card will be exiled, it will rarely be game breaking. Fires of Undeath – Firebolt as an instant costs three mana? This is worse than Firebolt, which isn’t even Vintage playable. Flayer of the Hatebound – This creature offers a flavorful twist on the Electropotence function built into it. Unfortunately, that function is worth almost nothing in Vintage. The casting cost here confirms it. Forge Devil – Almost strictly superior Sparkmage Apprentice in Vintage. Gather the Townsfolk – An inferior Raise the Alarm because Raise the Alarm is an instant. The bonus of being able to get five tokens at less than five life does not render this useful in Vintage. Gavony Ironwright – The latest Standing Troops, Border Guard, Femeref Scouts. Comparable to Palace Guard or Benalish Emissary, none of which are playable. Geralf’s Messenger – A variant on Dakmor Ghoul/Highway Robber with comparable tradeoffs. Neither of those cards has ever seen Vintage play, nor should they. Geralf’s Mindcrusher – Six mana is far too expensive for an Ambassador Laquatus/Hedron Crab effect. This card is also not efficient enough to see play over a card like Cerulean Sphinx or Guile. Gravepurge – An identical reprint of Footbottom Feast, which was a modified reprint of Bone Harvest. Gravetiller Wurm – The “morbid” version of Baloth Woodcrasher. That means it’s even less playable. Grim Backwoods – Worse than Horizon Canopy. Grim Flowering – An asymmetrical Nature’s Resurgence. Better than Collective Unconscious. An enormously powerful effect; the casting cost is extremely prohibitive. For the casting cost, you’d have to have 4 creatures in the graveyard to make this comparable to Braingeyser. Six mana is the upper limit of playability for non-artifact spells in Vintage, and cards that aren’t Blue or Black generally don’t see play at that casting cost unless they can be cheated into play. Griptide – A reprint of Repel. Far less efficient than Submerge, and far less versatile than Temporal Spring. Gruesome Discovery – Much weaker than Hymn to Tourach. Harrowing Journey – Compare this to Night’s Whisper, which sees only marginal Vintage play these days. Havengul Runebinder – A more expensive reprint of Cemetary Reaper in Blue. This won’t see play either. Havengul Lich – This is not really a Lich, but a variant of Volrath’s Shapeshifter/Dimir Doppelganger. This card should be great in Type 4, but is unplayable in Vintage. Headless Skaab – Three casting cost non-artifact creatures that don’t generate card advantage or disrupt the opponent don’t see play in Vintage. This wouldn’t be playable even if it came into play untapped. Stitched Drake is much stronger, and it doesn’t see any play. The idea of exiling cards from the graveyard to reduce the casting cost of a creature is a good idea, but as of yet, there are no such creatures efficient enough for Vintage. Heavy Mattock – Strictly inferior to Champion’s Helm, Vulshok Morningstar, and all of the “Sword of X & Y” cycle. Heckling Fiends – Gray Ogre with Incite as a 3 mana activation ability. Hellrider – The utility bonus is worthless in Vintage, and there are a half dozen Red creatures at the same casting cost that would be better that don’t see any Vintage play. Highborn Ghoul – Worse than Bloodghast, Vampire Hexmage, Dark Confidant, Yixlid Jailer, Skinthinner, and even Nantuko Shade. Hinterland Hermit // Hinterland Scourge – A 3/2 creature for 2 with Lure is not that great. This isn’t even that. Hollowhenge Beast – A reprint of Silverback Ape. Worse than Ant Queen, Arashi, the Sky Asunder, Molder Slug, etc. Hollowhenge Spirt – This is the third card since False Orders that removes a creature from combat, and only the second creature that can do so (the first being Balduvian Warlord). That being said, it’s unplayable. Hunger of the Howlpack – Worse than Giant Growth most of the time. Huntmaster of the Fells // Ravager of the Fells – One can certainly appreciate the attractiveness of this card: it provides bonuses when it comes into play, and every time it transforms. Unfortunately, the bonuses generated by this creature: creating token permanents, small bits of damage and life gain, are the least valuable for Vintage play, which is about mana denial, card advantage, and other forms of disruption. Immerwolf – Raging Kavu would be a better threat. Increasing Ambition – Demonic Tutor now casts five if you give it flashback? I’ll take Grim Tutor or even Diabolic Tutor over this. Increasing Devotion – The latest incarnation of Icatian Town. Comparable to Conqueror’s Pledge. Clearly worse than Decree of Justice. Increasing Savagery – The latest and inferior Bounty of the Hunt variant. That does not bode well for its Vintage playability. Increasing Vengeance – Worse than Fork or Twincast because of the words “you control.” Otherwise, this would be better than Fork or Twincast, which don’t see Vintage play right now. Jar of Eyeballs – Read the first sentence: “Whenever a creature you control dies, put two eyeball counters on Jar of Eyeballs.” When does that happen in Vintage with any regularity? Creatures in Vintage are bounced or removed, but infrequently die. This card also has an expensive activation cost. If a creature dies, and if you pay 3 mana, you get a mini-Impulse. Not playable. Reminds me of Aladdin’s Lamp, honestly. Kessig Recluse – The additional power & toughness version of Deadly Recluse for twice as much mana. Lambholt Elder // Silverpelt Werewolf – Three mana for a 4/5 Ophidian would be likely Vintage playable, although a case could be made for Cold-Eyed Selkie over it. Three mana for a 4/5 inconsistent and unreliable Ophidian is not playable. Lingering Souls – Midnight Haunting with flashback. Whether it is inferior or superior is not particularly critical. Neither card will see Vintage play. Lost in the Woods – Despite the novel effect, a 5cc permanent that can fog individual creatures is not remotely Vintage playable. No Fog effects see Vintage play, and this won’t be the first. Loyal Cathar // Unhallowed Cathar – Comparable to Haunted Angel. The ‘Penumbra’ effect has very marginal Vintage utility. This creature is not efficient or disruptive enough to see Vintage play. Markov Warlord – Comparable to Glarewielder in power. Midnight Guard – Strictly superior to Regal Unicorn, but worse than Kor Sanctifiers. Mikaeus, the Unhallowed – Six mana for a 5/5 flyer is not a good deal. Better than Ihsan’s Shade, but worse than Oona, Queen of Fae. Mondronen Shaman // Tovolar’s Magehunter – I love the idea of an unconditional Pyrostatic Pillar on a creature for Vintage. But there is no way this guy will be transformed at the relevant time, and he’s otherwise too expensive. If he were already transformed, he would be serious Vintage consideration. Moonveil Dragon – The latest Shivan Dragon variant. I’d rather Hoard-Smelter Dragon, Covetous Dragon, or Rorix Bladewing. At least the former is remotely playable. Mystic Retrieval – A more expensive Relearn with flashback. There are more efficient ways to take multiple turns with Time Walk. Nephalia Seakite – The latest Pendrell Drake variant, this time, with Flash, in lieu of other abilities. Nearheath Stalker – There are no currently playable 5cc red creatures in Vintage. I’d rather play Ancient Hydra. Niblis of the Breath – Almost strictly superior to Puppeteer. Probably better than Pestermite, which means it’s really good in Limited. Niblis of the Mist – Worse than Somnomancer. Niblis of the Urn – They finally printed Seasoned Marshal as a 1/1 flyer. It’s still unplayable in Vintage. Predator Ooze – A 3cc 2/2 (which is what this is when it attacks) is a Gray Ogre in Vintage. The average number of turns per player in Vintage is just beneath 6, making this card pretty small in comparison to creatures like Tarmogoyf. Pyreheart Wolf – A creature that gives other creatures Gorilla War Cry/Demoralize. Ravenous Demon // Archdemon of Greed – A 9/9 flyer with trample for 3BB might possibly be playable in Vintage. Such a creature with the upkeep penalty present here is clearly not. The conditionality of achieving this undesirable position confirms it. Reap the Seagraf – This is no Call of the Herd, but it is better than Moan of the Unhallowed. Relentless Skaabs – Comparable to Serra Sphinx. Requiem Angel – Worse than Teysa, Orzhov Scion for the creature bonus, and generally worse than Baneslayer Angel. Russet Wolves – This is a reprint of Hill Giant. Sanctuary Cat – This is a reprint of Devoted Hero/Volunteer Militia. Saving Grasp – Narrower than Silent Departure. Scorch the Fields – A Stone Rain that can kill Dark Confidants and Snapcaster Mages. Comparable to Devastate or Implode. Scorned Villager // Moonscarred Werewolf – Flipped, it’s a more versatile Priest of Titania. This won’t always be flipped. Screeching Skaab – This has the potential to generate card advantage for you, but not reliable enough to see Vintage play. This won’t see play over Snapcaster Mage or Dark Confidant. Nor is it likely to see play with those cards. Séance – A quasi-Enduring Renewal, except one that prevents infinite loops. Actually, it’s more like a recurring Resurrection, but one that puts the creature into play for one turn. None of those cards are Vintage playable. Secrets of the Dead – This is a novel effect. There are many spells in the Vintage card pool that provide conditional draws, but none that trigger when spells are played from the graveyard. Moreover, drawing cards is a very powerful and desirable effect for Vintage. Therefore a card that may potentially serve as a draw engine deserves careful analysis. There are many excellent, even restricted Vintage spells, at this casting cost. Many of them draw cards, like this one. Clearly, the casting cost does not prohibit this card from seeing play. Furthermore, there are spells that see play or have seen play in Vintage that provide conditional draws, like this card. Cards like Standstill, Mystic Remora, Riddlesmith, Horn of Greed, Glimpse of Nature, and Compost are all examples. The question of playability then hinges on the degree of conditionality in relation to the efficiency of the spell. For example, Vedalken Archmage provides a rather modestly conditional draw given the density of artifact spells per Vintage deck, and the number that can be safely designed into a deck. However, the casting cost is too high relative to the effect. Riddlesmith resolves this problem, but creates another, by failing to provide actual card advantage. Conditionality has many forms, but primarily appears in terms of the requirements for triggering the draw effect and the permanency of the card providing this effect. Cards like Standstill, Mystic Remora, and Glimpse of Nature are temporary. Cards like Compost, Verduran Enchantress or Horn of Greed are permanents, but stay in play unless destroyed or removed. In this case the critical question is: how often or how reliability can you play cards from the graveyard with this in play? More succinctly, is it realistic to implement this card as a meaningful draw engine? In the entire Magic card pool there are only around a hundred cards with Flashback, and only a tiny fraction of those spells see play in Vintage. There are other spells such as Snapcaster Mage, Past Into Flames, and Yawgmoth’s Will that would allow spells without Flashback to trigger Secrets of the Dead. While the casting cost is high relative to the effect, it’s difficult for me to imagine how this could be a meaningful or useful draw engine even if it were zero mana. Dredge is the only deck in the format that already relies on flashback spells to advance its game plan, but it has no need of this spell to accelerate that game plan. Decks with Yawgmoth’s Will, Snapcaster Mage, or theorized decks with Past Into Flames seem equally unlikely candidates, although the latter is more speculative. Will and Mage decks would not clutter their shell with unreliable and somewhat inefficient effects for modest gain. Will and Mage already provide sufficient card advantage. Ultimately, this isn’t castable in a Dredge deck, and there are no other strategies in Vintage that play spells out of the graveyard with enough frequency to justify including this spell. Skirsdag Flayer – The latest iteration of the Royal Assassin, Shriekmaw, Bone Shredder, Nekrataal, etc. family tree, and a middling/weaker progeny from that group. Shattered Perception – A slightly less efficient Tolarian Winds in Red with Flashback. I’d rather play Winds of Change in most cases. Shriekgeist – The non-metalcraft version of Screeching Silcaw. Sightless Ghoul – This creature is worse than roughly three-quarters of the 2/2 black creatures at this casting cost (e.g. Cat Burglar, Demon’s Jester, Dread Specter, Krovikan Horror, Ostiary Thrull, etc.). Silverclaw Griffin – Comparable to Sabertooth Wyvern. Worse than Mirri the Cursed. Skillful Lunge – A reprint of Thunder Strike in White. Somberwald Dryad – Grizzly Bear with Forestwalk. Strictly superior to Lynx, Rushwood Dryad, and Zodiac Monkey. Sorin, Lord of Innistrad – Four casting cost planeswalkers have proven Vintage playable. 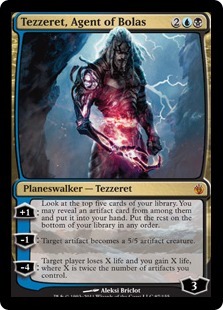 The planeswalkers that see play with any frequency in Vintage are Jace, the Mind Sculptor, Tezzeret the Seeker, Tezzeret, Agent of Bolas, and Liliana of the Veil. Given that this is a novel effect, it is worth a critical inspection. Two of the three abilities are not particularly relevant for Vintage. The first ability brings to mind Elspeth, Knight-Errant, which has not proven Vintage playable, although it has been tried. The second ability largely bolsters the first, and may be comparable to Elspeth’s second ability. The ultimate is attractive, but difficult to achieve since it requires at least three activations of the top ability first. In the final analysis, this card strikes me as comparable in power to Elspeth, Knight Errant, which has proven itself not to be Vintage playable on any sustainable basis, as of yet. That leads me to believe that this card is similarly unplayable. The awkward BW mana requirements – there are no decks in Vintage that play black and white unless they feature rainbow lands – supports my conclusion. Soul Seizer // Ghastly Haunting – This is a more expensive and conditional Control Magic, and an even worse Sower of Temptation. Unplayable. Spiteful Shadows – The Stuffy Doll ability is now an enchantment that can be put on a destructible creature. Stormbound Geist – Cloud Elemental with Undying. Worse than Welkin Tern. Stormkirk Captain – The second Vampire lord after Captivating Vampire. Strangleroot Geist – The haste is nice because it can attack a Jace, but it won’t kill one. And since Green is most often a secondary or tertiary color, even in G/W/x beats decks, this card is not easy to play in a deck trying to cast Qasali Pridemage and Gaddock Teeg. It’s just worse than Tarmogoyf. Sudden Disappearance – Momentary Blink on all of one player’s permanents with a slightly longer duration to the effect. For six mana, I can’t fathom any Vintage applications. Talons of Falkenrath – A Firebreathing variant with Flash. Thought Scour – A targeted Mental Note. In most cases, that means it’s superior, although it can be Diverted or Misdirected. Mental Note hasn’t appeared in a Vintage Top 8 since 2008, and this won’t either. Thraben Doomsayer – The latest Boris Devilboon. Similar to Imperious Perfect in terms of casting cost, ability, and bonus. The trade off is that an additional colored mana means no mana activation cost, and the more conditional bonus means a naturally larger bonus. Unplayable. Tower Geist – Comparable to Sea Gate Oracle. This card has one of the critical features of playable Vintage creatures: it provides card advantage. Unlike Sea Gate Oracle, I like how one of the cards goes to the graveyard rather than the bottom of the library. It’s also a meaningful body with 2 power. The problem is that it costs 4 mana. Like Sea Gate Oracle, it wouldn’t see play at 3 mana either. Tracker’s Instincts – Better than Gift of the Gargantuan. This card is not only at a playable casting cost, but it can provide card advantage from by having Flashback, and by virtue of the fact that the other revealed cards are deposited in the graveyard. Still, I’m not convinced it’s better than Impulse or Strategic Planning because of their versatility. Ulvenwald Bear – Gray Ogre with Morbid bonus. Undying Evil – The set’s mechanic is not Vintage relevant. The main reason is that creatures die as often as they are removed or bounced. In addition, expending a spell or wasting a deck slot on a card that is entirely devoted to keeping a creature in play is not worthwhile in Vintage. That is why Death Ward and Regenerate see no play in Vintage. This won’t either. Vengeful Vampire – Much worse than Kokusho, the Evening Star or Oona. Vault of the Archangel – It is possible to imagine uses for this land, but the opportunity cost of the slot is simply too high for an effect so narrow. The only lands that see play in Vintage that don’t tap for colored mana either generate more than 1 mana, or are Library of Alexandria, Bazaar of Baghdad, Riptide Laboratory, Wasteland, Strip Mine, Ghost Quarter, Mishra’s Factory, etc. Village Survivors – Strictly superior to Plated Wurm, Meng Huo’s Horde, and Blanchwood Treefolk. Vorapede – Weatherseed Treefolk was the original 5cc undying green creature. Warden of the Wall – The casting cost is not prohibitive, but the opportunity cost of the slot is. A 2/3 wall for 3 mana that taps for just one mana, and not even on the turn it comes into play, is just worse than Palladium Myr. Wakedancer – Gray Ogre with one Bridge from Below trigger. Wild Hunger – Comparable to Predator’s Strike and Wildsize. Wolfbitten Captive // Krallenhorde Killer – An unconditional 1cc 2/2 green creature wouldn’t be Vintage playable. This isn’t always going to be that good. Wolfhunter’s Quiver – For Vintage purposes, its worse than Viridian Longbow. There are no Werewolves in Vintage. Wrack with Madness – Repentance and Kiku’s Shadow reprinted in Red. Young Wolf – I suppose this is better than Tarpan, but it’s much worse than Wild Nacatl, and a host of other creatures. Zombie Apocalypse – In Vintage, you’d be lucky to destroy even a single creature with this spell, and likely get almost no value out of the All Hallow’s Eve effect. Even if this card cost 2 mana, it wouldn’t see any play. Afflicted Deserter // Werewolf Ransacker – In theory, this card can be deployed as a recurring artifact destruction machine. For four mana, you can play a creature that will, on every opponent’s upkeep, destroy an artifact in play, and deal three damage to them. This obviously has the most potential as an anti-Workshop threat. Provided you can play it, you can then attempt to flip it every one of your opponent’s upkeeps by playing nothing on your turn. Then, obviously, they will do their best to flip it back, forcing you, once again, to play nothing. Alternatively, they only play one spell, and you play the other, to get this card to flip back. First, four casting cost is not easy to reach against Workshops, but it’s not infeasible either. Jaces resolve, especially if you can Drain into this. The more troubling problem is that you will often need or want to play spells on your turn, cards like Preordain or a Mox, to continue to advance your plan. In some ways, this card has an Epic mechanic quality: it may be the last spell you ever play. Then, getting it to reliably flip repeatedly may be harder than it looks. Finally, my main concern is that it won’t actually do anything for three turns because it won’t flip the turn after it came into play. It’s slow like Smokestack. It doesn’t do anything until your opponent’s turn after next. In that regard, I’m having a difficult time seeing this card being played over, say, Ingot Chewer or Trygon Predator, or even Viashino Heretic. The main reason to play this card, then, is because of its power and toughness when flipped. Still, it’s a remote consideration for any Mana Drain deck sideboard, as it’s a savage beating if it can be properly and consistently manipulated. Beguiler of Wills – This card is castable in Vintage, and therefore playable in theory. There are plenty of five casting cost spells that see play in Vintage, or have seen play, beginning with Tezzeret the Seeker in contemporary Vintage. The effect generated by this creature particularly timely given the proliferation of creatures throughout the format. Unlike other Control Magic effects, or creatures like Old Man of the Sea or artifacts like Vedalken Shackles, this creature can continue to accumulate creatures. The main reason I think this creature won’t see play is Sower of Temptation. The difference of one mana is substantial enough, but that difference is more accentuated by the fact that you’ll need another turn to activate it. That makes this creature two turns slower than Sower. And Sower is a larger threat, and can’t be killed by a simple Darkblast. Call to the Kindred – A mini-Oath of Druids variant. This card could certainly be used to cheat in very large creatures by casting it on much smaller ones. For example, you could enchant a Stormscape Apprentice to cheat into play cards like Memnarch. However, the high conditionality gives me high confidence that this card is unlikely to see Vintage play. Oath of Druids only resolves when your opponent has more creatures than you have. This card only resolves when you have a creature in the top 5 cards of your library, and only then if that creature shares the same type as the one which is enchanted. Both of those conditions are limiting, but together they are extremely limiting. I am unsure whether the fact that this has to enchant a creature or the limitation of only looking at the top 5 cards is worse. In either case, I don’t see this card being played in Vintage, but the recent shift towards creatures means that I can’t rule it out. The capacity to create recurring card advantage and to cheat monsters into play means that it is a card worth abusing. The other concern I have is the stability of the creature which this card is enchanting. A Jace activation will destroy your plan. Curse of Echoes – A permanent Fork/Twincast. This effect is certainly Vintage playable. Copying every instant or sorcery an opponent plays is akin to saying copy half an opponent’s deck in many matchups. The problem is that this casting cost is extremely prohibitive. That said, the effect of resolving this spell may be so great that it is worthwhile. It’s not easily maindeckable, since strategies like Workshops don’t rely on Instants or Sorceries, but it could be a powerful anti-Blue tactic. If this cost three or less mana, I would put this into the playable section. At five, it’s only a remote consideration, and an unlikely playable. Still, it can’t be ruled out. Curse of Exhaustion – An asymmetrical Rule of Law for one additional mana. Rule of Law has seen Vintage play, and I suspect this could too. There are two limitations: Ethersworn Canonist sees a good deal of play, and is half as expensive. The other problem is that decks for which you need this effect are generally fast, and this card may simply be too slow compared to Rule of Law. Deadly Allure – It produces more of a bonus than Virulent Swipe, and is more efficient than Lace with Moonglove. This card could be used to manipulate combat in Vintage, and even kill Tinker bots. This is efficient enough for Vintage play, but likely too narrow. I don’t think this card is better than Thornweald Archers, which has seen Vintage play though. Faithless Looting – Careful Study currently sees no play in Vintage, which gives me low confidence that this will either. The question is: does the flashback ability provide enough advantage over Careful Study to make this card playable? My initial answer would be no, especially since Blue is a superior color in general. A deck like this might not be very good, but it sure looks fun! You probably would want to figure out how to include more Blue countermagic, like Flusterstorm, Mental Misstep, and the like. You might even want Circular Logic, although it seems antiquated. Vengevine seems like the obvious plan for a deck like this. You want to accelerate into Vengevines. Older Madness decks used Roar of the Wurm, Arrogant Wurm, and Squee, Goblin Nabob for card advantage. A deck like this benefits greatly from being able to flashback Careful Study. Havengul Fengraf – This card has many applications, especially in a deck that would play with Crucible of Worlds and doesn’t need colored mana. However, in such a deck it would be worse than Buried Ruin, which only seems a bit of play thus far. This card is potentially playable in Vintage, although unlikely to see much, if any, action. Helvault – A reusable Tawnos’s Coffin with a far more expensive activation cost. Tawnos’s Coffin sees no Vintage play, but does the reusability make this a viable Vintage tactic? At the activation price of 7 mana, I’d have to seriously doubt it. However, if you could begin activating this card using Metalworker in the MUD mirror match, you could potentially get some value out of it. The problem I see is that 7 mana is simply too prohibitive to use reliably, and therefore too condition to be reliable. What persuades me that this card is unplayable is the lack of play Spine of Ish Sah has seen. The MUD mirror is decided by spells other than these. However, the recursive function means that it cannot be completely ruled out. Increasing Confusion – The X version of Tome Scour/Vision Charm. What Braingeyser is to Ancestral Recall for this effect, but with Flashback. This card is unlikely to see Vintage play. First of all, in order for this effect to be useful, it must be large enough to win the game. This is why cards like Traumatize or Glimpse the Unthinkable do not see play. The only cards with this effect to see play in Vintage at the moment are Brain Freeze, Helm of Obedience, and Oona, Queen of Fae. Brain Freeze produces this effect for just two mana, and a bunch of storm. Still, the flashback ability offers the possibility for play as a Worldgorger Dragon combo finisher. It can be discarded to Bazaar, and later used to win the game. In fact, it can be used to win the game in lieu of a Bazaar. If you can get this into the graveyard, you can win once you initiate the Dragon loop. Amusingly, you could play this on yourself in the first instance to move Dragon into the graveyard, and then as the win condition once you have Reanimated him. Markov Blademaster – This card is somewhat confusing. Let me explain how it works. You resolve Markov Blademaster, and pass the turn. Next turn, you attack. Supposing that he’s unblocked, he deals 1 first strike damage, and then gains a +1/+1 counter. Then, he deals 2 regular combat damage, and gets another +1/+1 counter. So far, he’s done 3 damage. The next turn, you attack, and if he’s unblocked he deals 3 first strike damage, then gains a +1/+1 counter, and deals 4 regular combat damage, and gets another +1/+1 counter. This turn he’s deal 7 damage, and 10 damage so far this game. The following turn, he attacks. And if he is unblocked, he deals 5 first strike damage, then gains a +1/+1 counter, and deals 6 regular combat damage, and gains another +1/+1 counter. This turn, he’s dealt 11 damage, and 21 damage so far this game. In effect, he gains two power every turn, if he’s unblocked. This is a pretty fast clock. However, it is a clock that operates only if he is unblocked. If he can get the first attack in unblocked, then he can likely survive future combat. The main constraint on this creature’s playability is clearly his casting cost. The creature deals damage fast enough to see play in Vintage, and Vintage is the format where he’s most likely to attack unblocked. There are very few decks in Vintage that can quickly assemble RR mana. Blue-Black control decks typically run one or two Volcanic Islands, and would not run this creature over Tarmogoyf or even Kiln Fiend, which would likely win the game as quickly on average. Beats decks, particularly a mono red, W/R or W/R/x Beats hater deck might be able to use this creature. That seems to me to be the most plausible home for him. It would maximize his tempo qualities while providing the red mana necessary to reliably cast him. Those decks likely run Simian Spirit Guide as well, making him a possible turn two – or even turn one, with a Mox, play. That could be a truly terrifying prospect. He is a remotely playable Vintage card given the possibilities I just mentioned. Tragic Slip – Darkblast is the gold standard for this effect, and it sees only intermittent play in Vintage now that Dismember has joined the group. The advantage Tragic Slip having over Darkblast is that it can kill Lodestone Golems, Tarmogoyfs, and Blightsteel Colossi. It is difficult to determine whether Tragic Slip will replace or displace Darkblast in Vintage sideboards, and although it seems unlikely, I wouldn’t rule it out entirely. This card is remotely Vintage playable. My initial analysis of this card was that it would be, best, a possible win condition for Metalworker decks. I overlooked the most important application: Stoneforge Mystic. If it isn’t implicit in this article, let me make it clear now: creatures are back, and they are back in a big way. The two big direct winners from this set are Tarmogoyf and Stoneforge Mystic. With Grafdigger’s Cage in play, either creature is about the best win condition possible in the format. That’s a big reason why I think that planeswalkers are also big winners, and I will identify some of those in the section on Cage. This card makes Stoneforge Mystic even better. I think it’s possible, although not a given, that this set will trigger a color realignment. White is going to get a gigantic boost — not just with Thalia, but with Cage, and with this card, by powering up Stoneforge Mystic, who has just shot to the top of the heap as a playable Vintage threat (you’ll notice I’ve also added Stoneforge to the complete Vintage checklist as well). I expect this card to appear in Vintage Top 8s. Get one now. Grafdigger’s Cage – Immediate and possibly permanent Vintage staple. The effect upon reading this card was similar to my experience upon seeing Trinisphere spoiled or hearing the news of the errata of Time Vault: it was a momentous event in the future of the format. The awkwardly named Grafdigger’s Cage will become a Vintage staple in short order. First and foremost, the casting cost is well within Vintage parameters. There are over a dozen played artifacts at that casting cost. Two of the more powerful tactics in the format are Tinker and Yawgmoth’s Will. I can think of no card that shuts down both almost entirely, until now. That fact alone probably guarantees playability. Given both its tactical strength and casting cost, it is impossible to conclude that this card won’t see Vintage play. My task, however, is not simply to assess its playability, but to understand role and to predict its effects. As I said, this card stops the two most powerful tactics in the format: Tinker for Blightsteel Colossus and Yawgmoth’s Will for overwhelming card advantage. Tinker and Yawgmoth’s Will are far and away the most dominant restricted spells in the format, and have a sizable margin lead over Time Vault for dominant tactics as measured by appearances in percentage of Top 8 decks. The decks that typically abuse both cards are the ‘big Blue’ or UB Control and UB Combo-Control decks. These are generally the most powerful decks in the format, employing the best Blue countermagic and draw, and the greatest density of restricted spells outside of more dedicated storm decks. In the past, employment of a tactic that stopped either one of those threats was not particularly concerning. Thus, bounce effects or targeted graveyard removal is rarely a concern for a ‘big Blue’ deck as it will simply rely on the other tactic to win the game. This card is more concerning because it takes out both tactics simultaneously. However, the power Blue decks are not without options. They can still rely on Jace, Dark Confidant, and Gush to generate card advantage, and Time Vault + Key as a powerful two card alternative that is not shut down by Cage. However, these seemingly countervailing considerations are actually not that strong. The primary function of both Jace and the GushBond engine is usually to set up, execute, and protect a lethal Yawgmoth’s Will or Tinker. Without the ultimate strategic finisher of Yawgmoth’s Will or Tinker available, Jace and Gush as supporting apparatus lose much of their luster. It’s a lot of gear spinning for little pay off. The exception is, of course, Time Vault, which becomes more important. We have never had a card that for so little investment and mana cost removes from the strategic viability two of the three dominant strategic finishers in the game: Tinker, Yawgmoth’s Will, and Time Vault combo. A few conclusions should be evident. First, big Blue decks will likely not rely much, if at all, on Cage because of the way it impacts their game plan. Thus, they will likely not rely on it much as answers to Oath or Dredge, for example. The collateral damage is simply too great. Second, Cage should produce a greater reliance on Time Vault as a strategic goal, but also incentivize big Blue decks to include more strategic finishers. However, the typical alternative strategic finishers, like Empty the Warrens or Tendrils of Agony, were often powered by Yawgmoth’s Will. These are obviously less attractive strategic alternatives as a consequence. Ditto Snapcaster Mage, which generates card advantage for the power Blue deck. Similarly, Gifts Ungiven is weakened. Nonetheless, I expect a diversification of strategic finishers as a result, and greater reliance on Time Vault as a backup. Specifically, I think we can expect to see more Tezzerets of both varieties as finishers. Tezzeret the Seeker can help you find the Time Vault combo, and Tezzeret, Agent of Bolas can also do the same, but win the game just as well, and almost as quickly. It is not just that the finishers that typically see play in Vintage, like Empty the Warrens, Tendrils, Blightsteel Colossus, or Brain Freeze rely in one way or the other on cards like Tinker or Yawgmoth’s Will, it’s also the engines that rely on Yawgmoth’s Will to justify the investment. Cards like Necropotence more often than not result in a lethal, game winning Yawgmoth’s Will. By taking Yawgmoth’s Will out of the equation, you weaken most of the most powerful draw engines in the format, from Thirst, to Gifts, to Fact or Fiction, to Necropotence, to Yawgmoth’s Bargain, to Mind’s Desire. These cards lose much of their luster since most were channeled through a game winning Yawgmoth’s Will. That’s why I see the Tezzerets as big winners here. The greater reliance on Time Vault means that it should be easier to shut down that strategic finisher as well. Both Workshops, Fish and Beats decks can use Phyrexian Revoker or Stony Silence/Null Rod. Revoker has the additional advantage of also hitting Jace. But as blue decks diversify strategic finishers to cope with the diminished utility of Tinker and Yawg Will, Revoker certainly gains power. I also expect Blue decks to adopt more tactics designed to combat Cage, especially if Cage sees increasing play over time. In addition to the prevalence of Trygon Predator, expect to see more maindeck Steel Sabotages, Nature’s Claims, Mental Missteps, and perhaps, ironically, Ancient Grudges. Power Blue decks will feel the effects of Cage as Shops, Fish and Beats decks utilize it to turn off the two most powerful strategic finishers in the game. Oath of Druids is clearly directly impacted by this card, and may be the biggest loser of all. Workshops, Fish, and Beats decks are typically Oath’s best matchups. Yet, it is these decks that stand to gain the most and can use Cage with minimal drawback. Shops, Fish, and Beats deck can now deploy Cage to combat power Blue, Oath, and Dredge simultaneously. To that extent, I see this as a maindeckable card for Beats, Fish, and Workshop variants, much as Null Rod, Stony Silence, and Phyrexian Revoker are currently maindeckable. Oath of Druids isn’t by any means dead, but it is significantly weakened. Oath of Druids was on an upward arc given the trajectory of Vintage as described in the waning months of my 2011 Vintage Year in Review. I expect Oath to find ways to combat this threat. That will partly mean tactical answers, like increasing use of Mental Misstep or Steel Sabotage, but also build-arounds, like using Laboratory Maniac as a finisher. With Cage in play, the Oath deck will Oath into the Maniac, which can’t be put into play, and which will then be drawn into hand, and presumably cast to win the following turn. We might expect Oath decks to sideboard into Maniac as an alternative option. Unfortunately for Oath, other backup plans, like Tinker are now taken out as well. However, Show and Tell may be a far more attractive backup plan for Oath pilots. The other major archetype to feel the immediate impact of this major printing is Dredge. Reviewing the list of impacted cards, you’ll see that most of Dredge’s major tactics are now taken offline. Its ability to advance its game plan is severely compromised. This should be the most celebrated consequence of Cage. Manaless Dredge decks are completely hosed by Cage. It’s true that Bridge From Below is not directly impacted, but all of the creatures that would generate Bridge tokens will no longer enter the battlefield in the first place. Mana versions of Dredge will now have to deal with Cage much like they do Leyline of the Void. They’ll need to use answers like Nature’s Claim to kill it, although counter-tactics like Chain of Vapor must be immediately followed by Cabal Therapy, which will be difficult to do. Ancient Grudge loses a lot of value for Dredge. I also expect Mana versions to attempt to find ways to answer it with cards like the one I’m going to discuss next in this set review, so I will save that discussion for then. Expect Nature’s Claims maindeck, at a minimum, for Dredge. Perhaps one of the most important aspects of this printing is not tactically, but structural. Dredge has typically had very high Game 1 win percentages against the field. As Fish and Shops adopt Cage maindeck, that will change. Now Dredge can expect very real predators in the metagame. I expect that this will negatively affect Dredge as a top tier deck, regardless of future adjustments. Other graveyard based strategies, like Minus Six/Worldgorger Dragon combo, can expect to lose that advantage as well. The primary direct effects of this card are to significantly weaken Oath, Dredge, and big Blue decks, especially those reliant on Snapcaster Mage. None of these decks are made unviable, but all will face somewhat uncomfortable adaptations. The seemingly obviously beneficiaries are Fish, Beats, Mid-Range, and Workshops. I would also add Landstill, which can now singlehandedly deal with all three of its worst matchups: Oath, Dredge, and the tactics of Tinker/Yawgmoth’s Will, which it doesn’t rely on. The superficial impact of Cage is clear. What is less clear is: 1) how those decks that are impacted will adjust, and 2) what the indirect or subtle effects of Cage will be. I’ve already attempted to answer the first question above in each relevant category. But the second question is even harder still, even though the two are related. It’s clear to me that the strategic focus of Vintage is shifting towards creatures. By taking out Oath, Tinker, Yawgmoth’s Will and Dredge with one simple tactic, you make simple and highly efficient beaters, like Tarmogoyf much more strategically relevant. Cards like Psychatog – or of that ilk – become much more valuable. Tarmogoyf + Cage is probably a trump board state for most Vintage scenarios. Ditto Cage + Standstill + Mishra’s Factory. Workshop players may wish to hold their applause. Notice that one of the responses I expect to Cage is even more maindeck artifact hate, like Nature’s Claims, Steel Sabotage, and even more Trygon Predator. While Workshops may appear to be a big winner, and they definitely have won here, their advantage will be tempered somewhat by an increase in the quantity of artifact hate. This is an indirect effect that can be safely predicted. As I said, I think a big winner will be the Tezzerets. Neither Tezzeret relies on Yawgmoth’s Will or Tinker, and the versatility of Tezzeret, Agent of Bolas, makes it very attractive as a strategic finisher. It generates card advantage without relying too much on assembling Time Vault, while providing meaningful threats to the board to combat the rise of creatures. Tarmogoyf, too, is a big winner. Trinket Mage may very well also see its stock increase. UBW Fish and Control decks like Wizards and Bomberman can now utilize Cage to stop opposing threats and give them a viable game 1 game plan against Dredge and Oath. What’s also interesting is to consider how many of the decks of Vintage past would be affected by this tactic. Gifts Ungiven decks would be totally neutered, since they were completely reliant on Tinker and Yawgmoth’s Will. Ditto Flash-Hulk decks, which relied on post-Protean Hulk recursion. Also, Thirst decks were extremely graveyard centric. While Tinker/Welder into Mindslaver is still viable, the other tactics that made Mindslaver recursion viable, like Pentavus recursion, are no longer possible. Goblin Welder is indirectly harmed. In fact, this card should put the nail into the coffin of Red Workshop decks. Goblin Welder is now a much weaker tactic, as you cannot weld in Lodestone Golem, Triskelion, or Duplicant with this card in play. Ultimately, Cage will settle the realignment that has been occurring over the last 8 months in Vintage with definitively clarity. The trend toward creature decks will continue and become more centered throughout the format, not because creatures are such a great threat, but because they become relatively greater viable strategic finishers. In layman’s terms, they deal damage. In conclusion, the most natural home for a card like this will be in authentic Beatdown oriented decks, like white/green base Beats and Workshop Aggro. These decks get all of the advantages of this spell, and none of the drawbacks. The fact that this card hurts Tinker & Yawg Will is a natural limitation on the degree of play this card will ultimately see. It may be a card whose presence and influence is greater than its actual appearances in Top 8s. That said, I fully expect Workshop decks to run between 3-4 of these between their sideboards and maindecks, and Beats and Fish decks to run between 2-4 and between maindeck and sideboard. This card is the marquee card from the set, and will see plenty of play. Ghoultree – To be playable in Vintage, this card needs to be reliably played for 3 mana or less. That means that you must have at least at least 5 creatures in your graveyard on a consistent basis. That leads to the natural conclusion that this could be a potential Dredge tactic. Dredge is the most prominent Vintage deck that is capable of doing this. As a Dredge tactic, how does this stack up? Dredge typically goldfishes the opponent by turn three or four, and often on turn two. It does so by generating many Zombie tokens, and by Dread Returning a Flame Kin Zealot at the final moment. Most of the cards in a Dredge deck are geared and focused around accelerating your game plan. To run this card in a Dredge maindeck, you’d be looking at cutting cards like Sun Titan, Fatestitcher, or, if you aren’t playing that package, some secondary disruption. This card is probably not faster than Fatestitcher, but I do think it offers a few major advantages. First, it is immune to Grafdigger’s Cage and Yixlid Jailer. In fact, this card is an excellent tactic for combating Grafdigger’s Cage. You can Dredge repeatedly, and accumulate the requisite creatures to hard cast this for a mere one mana. This may also be a viable sideboard tactic for combating Cage/Jailer. Unfortunately, this card is not very useful in fighting the most virulent anti-Dredge tactic: Leyline of the Void. For that reason, I believe it is severely limited as a Dredge counter-tactic. If this card is to see play, it will be as a maindeck tactic, and in that role I wouldn’t at all be surprised if it sees play. It’s Vintage playable, but I’m not certain that it will appear. There is also the possibility that it will appear in non-Dredge decks. That seems much less likely, unless it were to appear in something like the Madness deck that I presented in Part C.
Gravecrawler – I believe this card will definitely see Vintage play. Gravecrawler is a new Ichorid/Nether Shadow/Ashen Ghoul/Bloodghast effect. Each of these creatures have seen play in Vintage Dredge, and this one will as well. Unlike those cards, this is actually one of the most castable of that class of black creatures. It’s a Savannah Lions (or, more accurately, a Jungle Lion) Zombie that is recurrable. Each of the previous Nether Shadow effects have certain kinds of conditionality that limit their play. Ichorid requires you to exile another Black creature to bring it back, and this may only be done in the upkeep phase. Thus, in your upkeep, you already must have a Black creature to exile (or, at least, one available by the time the trigger is set to resolve). Nether Shadow requires multiple creatures above it in the graveyard. Bloodghast requires you to make a land drop. Like Ashen Ghoul, this creature requires you to pay a black mana, but it also requires you to have a Zombie in play. Unfortunately, aside from another Gravecrawler, the only other zombie one night reasonably have in play are Bridge From Below tokens. In traditional manaless or very mana light Dredge lists, this card wouldn’t make the cut. However, I think there are two facts that will make this card not only playable, but see substantial play in Vintage Dredge. First, there has been a trend to combat Leyline of the Void based upon the idea of deploying creatures in order to grind out games in the face of hate (see Gilberto Rivera’s recent Dredge list). When the opponent mulligans into a Leyline hand, they may often be so slow strategically, that you can gain traction by simply casting creatures. The creatures available to the Dredge pilot have been so inefficient and slow by comparison that this counter strategy has lacked speed. Until now. Gravecrawler is essentially a Jungle Lion in Black that can be bought back. A turn one Gravecrawler followed by a turn two Gravecrawler wins the game by turn 7, dealing 4 damage a turn. Add one creature into that mix, and you win the game a turn or two earlier. 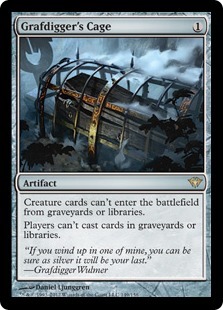 Gravecrawler not only does what Dredge decks naturally do, but it gives you a much stronger post-board tempo plan, either as a primary plan, or as a supplement while you fight Leyline. Imagine, for example, you have two of these creatures in play while you are simultaneously digging for Chain of Vapor or Nature’s Claim. Your opponent will have a war on two fronts. They can’t easily win both. With the printing of Grafdigger’s Cage, you can certainly expect Dredge decks to increase or at least bolster their maindeck mana supply. To that end, I totally expect Gravecrawler to be increasingly playable in the Cage environment, both for the reasons just described, but also as the mana supply increases marginally to support it. Thalia, Guardian of Thraben – Thorn of Amethyst as a legendary 2/1 creature. One mana less expensive than Glowrider, which has seen some remote Vintage play. Obviously, this card is Vintage playable. Thorn of Amethyst sees plenty of play, and is a Vintage staple. This card’s only limitation is that 1) it is not an artifact, and therefore can’t be played off of a Workshop, Ancient Tomb, or City of Traitors, and 2) is legendary, which means that running four is probably not an option. However, the fact that it is not an artifact is also an advantage, since that means that it can’t be destroyed by cards like Nature’s Claim, Ancient Grudge, Ingot Chewer, or an attacking Trygon Predator (or bounced by Hurkyl’s Recall and Rebuild). The fact that it’s legendary will simply create a limitation on the number that are generally included in any deck. We can look at Kataki, and the average number of Kataki’s that are included when Kataki sees play, for a sense of this. Generally, Kataki is a 2 or 3-of. Thalia should also be a 2 or 3 of. Glowrider is easily replaced with Thalia, and a few Cages should be added as well. Thraben Heretic is also a consideration. Thalia is an automatic 2 or 3-of inclusion in that deck. I would cut Aven Mindcensor for Thalia. An even stronger case can be made for the W/G version, which I created before Meandeck Beats, and which John Donovan Top 8’ed Vintage Champs with in 2009. In addition to being playable in beats decks, it may also have a place in decks similar to the mid-range Bant decks, such as the one that Brian DeMars recently created, or even Fish decks, although the more Blue you run, the more remote this card becomes as a viable inclusion. Aside from various Beats options, the other major possibility, and likely source of playability, for this card is in Workshop decks. The strong trend in Workshop play over the last few years has been mono-brown. The printing of Lodestone Golem pretty much put the nail in the coffin in attempting to splash colors into Workshop decks because of one simple reason: mono-brown Workshop decks offer much greater mana base consistency. Ancient Tomb has become pretty much mandatory in Workshop decks to help accelerate out threats like Lodestone Golem in lieu of a Workshop. By splashing other colors, you necessarily cut into your quantity of Ancient Tombs, and you have a more fragile and less consistent mana base. Your colors can’t be terribly consistent either, because there is a ceiling to the number of colored lands you include in a Mishra’s Workshop deck. There will be hands with colored spells and no colored mana, and vice versa. A deck like this could easily lead off with a turn one Thalia, and then curve out into a series of unbeatable plays. Horizon Canopy is a natural draw engine with Crucible, and Flagstones is amazing in the Workshop mirror. You don’t want to run White just for Thalia, so I’ve also included the powerhouse Balance and the increasingly valuable Swords to Plowshares, which can hit Dark Confidants, Tarmogoyfs, Snapcaster Mages, Blightsteel Colossi, among other threats. The main problem with a Thalia Workshop deck in the near future, and perhaps one of the main things to bear in mind, is that Thalia will accentuate the trend extant in this metagame around creature decks. Creatures have never been more salient in the Vintage metagame, and Thalia will only aid that process. I would be remiss if I didn’t mention this card’s First Strike ability. Combat is not common in Vintage, but it does happen. And when it happens, it tends to happen most frequently among creatures of precisely this power in toughness. Two of the most important creatures in Vintage are Dark Confidant and Snapcaster Mage – both of which could block Thalia. The fact that Thalia not only survives, but kills these Wizards is no small matter. It means that Thalia can be aggressively used, and even has utility in Workshop mirrors, surviving battles with Slash Panthers or Phyrexian Revokers. Thraben Heretic – A White creature that disrupts graveyard tactics. This creature is efficient enough to see play in Vintage. The obvious comparison is Jotun Grunt. This creature, like Jotun Grunt, is White creature that can disrupt an opponent’s graveyard tactics. Both have the same casting cost. I actually think this card compares well with Grunt. One of the drawbacks to Grunt is that an opponent can wait it out or simply overwhelm it. While it is very likely that a Dredge player can overwhelm this creature, this card not be outlasted like a Jotun Grunt. In fact, the most accurate comparison is probably Scavenging Ooze. However, Scavenging Ooze is actually better in most scenarios since it can be immediately activated and used more than once per turn. That said, for decks without Green, this card is a substitute. This card is Vintage playable, and I wouldn’t be surprised if it saw play in Beats decks without Green. Torch Fiend – Better than Hearth Kami or Manic Vandal, and comparable to a number of Red creatures that destroy artifacts, such as Goblin Tinkerer. This creature will often be better because it is a 2/1, and thus a meaningful combat creature. Most U/B/x decks will continue to prefer Ingot Chewer, although in decks with both Confidant and Snapcaster Mage, a meaningful case for Torch Fiend can be made. I recommend that you acquire these cards for your Vintage collection. Whether any of these cards will ever see play depends on circumstances largely beyond their control. For example, if white-base beats decks see increasing play over the next few months, then Thraben Heretic may well appear in Top 8s. Ditto mono red or red base beat decks in the case of Markov Blademaster.